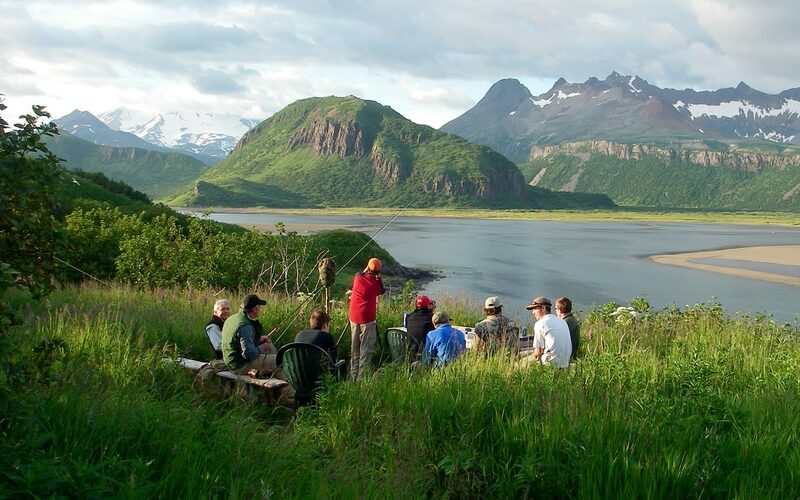 If you are a man that desires to embrace the rugged Alaskan wilderness and have a deep encounter with God this retreat is for you! Fathers are encouraged to bring their sons and other young men who are 12 years of age and older. Please leave your pets at home or they might become part of the food chain! The weekend retreat is a study in contrast… the best of both worlds. As men we tend to be extreme. While we like our guns, airplanes, and ATVs, we also embrace the solitude and quiet of nature. A place where we can hear the still small voice of God. And it is for this purpose that we come to the wilderness, to seek God in a deeper way, while in the company of other like-minded men. During the weekend we will meet together every morning and evening for inspirational messages, testimonies, and music. It is our hope and prayer that each man that attends the retreat will experience God and leave a better man! If you are planning to travel to camp via one of the two trails that lead to the camp, please use the buddy system or leave a travel plan with someone for your own safety. Weather conditions will dictate whether the trail down Alfreds Creek or Squaw Creek will be the best one to take. Contact Fritz Plier @ 376-9179 if you need direction or if you would like to tag along with another group. Hiking: 13 miles one way on a 4-wheeler trail (shorter/rougher than trail below). If you are planning to fly in, please contact Danny Whatley @745-5221 or Joe Koliadko @ 745-2222 for information on the runway. The airstrip is 850′ long, becoming shorter the past several years due to washouts and it has bad approaches at each end. This is not the airstrip to practice your newfound bush pilot skills. Please monitor 122.9 and announce your intentions and position when within five miles of the airstrip. Fly-ins: $300 per person round-trip; $150 per person one-way. If you need to be flown into camp, contact Mike Meekin at Meekin’s Air Service well in advance of the retreat to schedule flight into camp. Call 907-745-1626 or check their website at www.meekinsairservice.com. Weight limit for baggage is 50 lbs. for those being flown in. Bring your own backpacking food—cooking gear—stove/ cookware. Gold panning, hiking, target shooting, picture taking. Come prepared for cool nights and rain; one never knows! Share your talents—the more the merrier! Leave dirt bikes and three wheelers at home! Don’t be the object of a rescue going in and out of camp. Practice firearm safety at all times. Please no shooting during the Sabbath hours. Use only the designated shooting areas. Be respectful of others and enjoy quiet time from 10 pm to 7 am. Please use the designated outhouses. Please clean up after yourself and pack out all trash. Kent Sandvik has graciously allowed us to use his camp, so let’s keep it clean. Check for air traffic before driving near the runway. Drive ATV’s next to the runway, not on the runway. RETREAT THEME: Strong Fathers. Strong Sons.